Our parent Corporation, Patsy's, Inc., has been involved in Small, Medium, and Heavy Duty Truck and Bus Sales and Service for over 50 of its 100+ years in business! 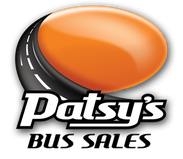 Patsy's Bus Sales continuously strives to provide new product lines, the latest technology, the greatest value, and outstanding customer service to its customers. We have a long list of prestigious customers such as Harvard, MIT, Dartmouth College, New Hampton Prep School, Holderness Prep School, numerous hospitals, nursing homes, summer camps, hotels, airport shuttle services, and more! "The Rowley Council on Aging is so excited about our "New" bus! It runs great, and fits all our needs. The seniors are really enjoying it. We truly appreciate all your extra effort in helping us obtain the bus. You certainly went the extra mile, including coming to MA to allow us to test drive as well as inspect the van. Truly above and beyond the call of duty." "Our facility purchased a 15 passenger bus from Patsy's Bus Sales in Concord, NH. We have been very pleased with our bus and with the service we have received from Patsy's. We use our bus many times a week - thanks for the great ride - our residents enjoy the bus very much!" "I would like to thank you for all of your assistance with the sale of my 2007 Turtle Top Van Terra. Although we live 3 states away, you made the distance seem non-existant. Your professionalism, promptness, and honesty did not go unnoticed, and was greatly appreciated. I will gladly recommend you and Patsy's Bus Sales in the future." Patsy's Bus Sales is part of The Patsy's Companies and The Profile Group of dealerships, a network of over 40 product lines in 22 locations throughout New England, offering our customers endless access to parts and service. A fixture in New England since 1917, we have been providing the region with commercial and consumer transportation solutions for over 96 years. It's no wonder we have become New England's Transportation Authority!